For mobile applications (on smartphones/tablets) a typical use case is that you let a user log in to your service, or create some kind of unique identifier for the user's device, which is considered the identity of the user, and that you then allow access only in the context of this user to your backend API. In order to prevent fraud or excessive usage of your API, it's also typical to apply rate limiting by number of calls per authorized user and application. You can now leverage the "local" authentication method of wicked to store your mobile users email addresses and passwords. Wicked can act as a full featured identity provider for your mobile backend, i.e. 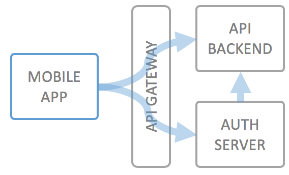 be a full mobile backend, including authentication and authorization. The developer incorporates the client ID into the mobile application and implements the needed bits for the OAuth2.0 Authorization Code Grant with the PKCE extension. For the Authorization Code Grant to work with public clients (a client which is not running on a server backend), wicked.haufe.io requires the PKCE extension to be implemented. Any deployed portal itself contains more information on the details on how to implement this, see e.g. the help pages of the wicked Demo portal. If the user identity was successfully established, the Authorization Sevrer now answers with a redirect back to the application, possibly using a custom schema, such as myapp://hello/world?code=abcdefabcdefabcdef. The application now uses the token and a PKCE code verifier to retrieve an access token and a refresh token, according to the standard OAuth 2.0 Authorization Code Grant. All requests which the application now issues towards the API will be enriched with (a) the client identity, and (b) the end user's identity, passed on as headers. How do I implement this with wicked? The wicked Authorization Server automatically creates suitable endpoints so that your API can only be accessed using access tokens which are created using this endpoint. When your backend API is called from the Gateway Proxy, and a valid access token is presented, Kong will automatically inject who is calling (as X-Authenticated-UserId), which application is calling the API on behalf of the user. You can leverage this injected information to do further checking on the user as your business logic requires, but wicked makes sure that only well-known users are being let through to your API. As mentioned, wicked supports the PKCE extension of the Authorization Code Grant (see RFC 7636) and OAuth2 for native apps (see RFC 8252).